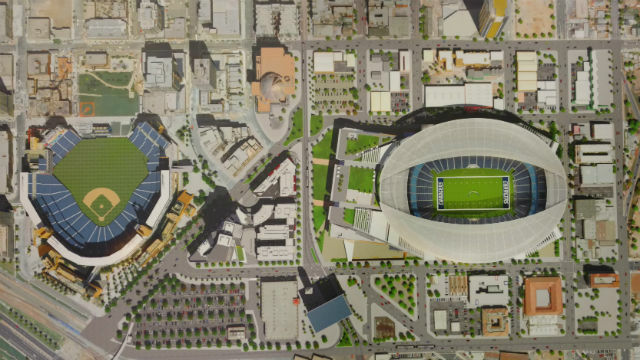 Rendering shows proposed stadium to right of Petco Park in downtown San Diego. Support remains below 50 percent for two ballot measures that would have a major impact on the future of downtown San Diego, despite some gains over the past few weeks, according to a poll released Friday. A sampling of nearly 600 likely voters by SurveyUSA found that 39 percent plan to vote for Measure C, which would establish the framework for building a football stadium and meeting complex in the East Village. That’s a gain of three percentage points since the last poll was released two weeks ago. Because the measure would increase San Diego’s hotel room taxes, it requires two-thirds support in the Nov. 8 general election to pass. Another 43 percent of respondents contacted between last Friday and Monday oppose the measure, an uptick of two percentage points. The poll conducted on behalf of 10News and the San Diego Union-Tribune found 18 percent still undecided. The poll is the second to show a modest increase of support among the public since Mayor Kevin Faulconer endorsed the measure on Oct. 3. Also, 55 percent of a small group of respondents who have already submitted their absentee ballots said they voted in favor of Measure C.
For Measure D — which would set a new course for tourism funding and downtown land use, prohibit an expansion of the San Diego Convention Center and encourage educational use of the Qualcomm Stadium property if the Chargers leave — had the backing of 30 percent of the respondents. It was opposed by 27 percent, while 43 percent were undecided. The City Attorney’s Office has opined that Measure D, which would also raise hotel room tax rates, requires two-third support to pass, too. The author of Measure D, lawyer Cory Briggs, argues that it needs a simple majority. Among voters who have already returned their mail-in ballots, 36 percent voted in favor of Measure D, according to SurveyUSA.